Amanda Addison, 41, suffered from severe back and leg pain, which affected her life both at home and at work. After six years of debilitating back pain and failed surgery a Leeds mum has a new lease of life. Mother of two Amanda Addison, 41, suffered from severe back and leg pain, which affected her life both at home and at work. It started after the birth of her daughter, Isobel six years ago. But in the last year the pain worsened to the point where she found it difficult to continue her physically demanding job running a busy North Leeds pub. 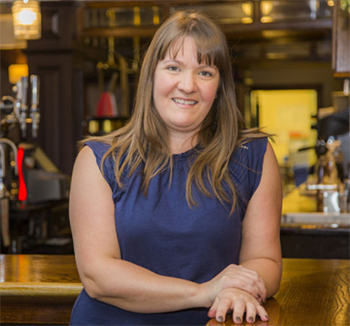 "Life was horrendous," says Amanda, who manages the pub with her partner Chris. "I couldn't drive due to the pain and I often felt stuck in the flat above the pub. It had a massive impact on my job. I couldn’t stand for more than half an hour yet my work often involved long hours and kept me on my feet all day. The pain gradually increased and I was in agony." Amanda tried various treatments including Pilates to strengthen her core, physiotherapy and a spinal cord stimulator, but they only gave temporary relief. She underwent decompression surgery to release the nerve but her symptoms persisted. "I was told by my doctor that nothing further could be done and I would have to live with pain for the rest of my life. I had given up all hope of finding a solution.” Worsening pain compelled her to return to see her GP and she was referred to Mr Deb Pal, consultant neurosurgeon at the Spire Leeds Hospital, who arranged for an MRI scan. The results showed scar tissue around her spinal nerves at the previous site of surgery which were compressed along with severe wear and tear in the joints at to levels of her spine. Mr. Pal suggested a two level revision decompression and spinal fusion. "He explained everything clearly and told me what I could expect to achieve from the surgery. I decided to go ahead. I could not face a future with this level of pain." Amanda underwent surgery in June. "When Amanda first came to see me, she was crippled with excruciating pain in her back and both legs, could hardly take a few steps and was experiencing a deteriorating quality of life,” says Mr Pal. “As she had exhausted all conservative treatments, we decided to go ahead with revision lumbar surgery to which she has had an excellent outcome with significant improvement and life style transformation." Twelve weeks after surgery life is starting to get back to normal for Amanda. "I'm still recovering from what was major surgery and am doing a regular physio programme. "I understand it will take time – maybe 9 to 12 months for the nerves and muscles to heal, however, the back and leg pain is massively improved. I can now walk to the nearby park and am starting to enjoy more activities with my children." Amanda's surgery involved a wide resection of the bone and spinal joints to create maximum room for the nerves from the back. As well as this the scar tissue stuck to the nerves was gently separated off allowing greater room around the nerves. Following this screws were inserted into the vertebra across three levels to stabilise the spine. The worn and torn discs between the bones were also removed and cages filled with artificial bone were placed in this space to support the spine.